David came to Matthaei-Nichols in 1990 and has been engaged with the collections and their broad use in the university community ever since. He currently serves on two interdepartmental academic committees: Museum Studies Program Faculty Advisory Committee and the 2009-10 Museum Theme Year Steering Committee for the School of Literature, Science, and the Arts. He also advises students on specific projects such as PITE 398, serves on various graduate student committees, and in the new undergraduate museum minor. In addition, he manages students to create interpretation for our collections and GPS data mapping of our living collection. Both of these projects are working to create a web-based interactive plant database. David holds a B.A with Highest Honors in Botany from University of North Carolina, Chapel Hill, and an M.A. and Ph.D. in Botany from Claremont Graduate School, Claremont, California. 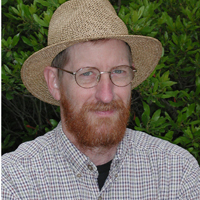 David is the author of numerous technical reports and papers, many for agencies. He is a long-serving member and past chair of the Editorial Committee for The Public Garden. For popular audiences, David is the co-author of Taylor’s Guide to Groundcovers, and he has coauthored articles in Horticulture magazine. His own garden has appeared in several publications, and he is a popular public speaker. David has led garden-study tours in Asia, Europe, New Zealand, and North America.